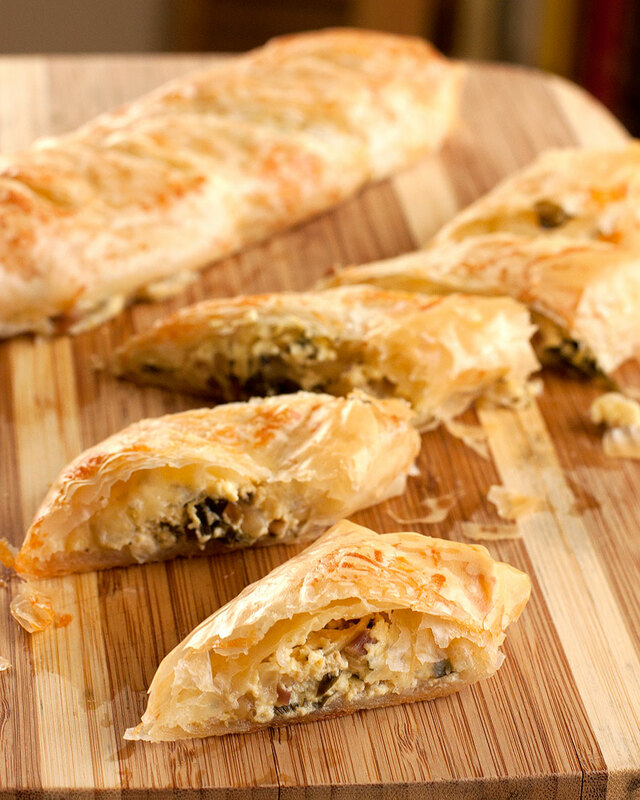 Ramp, Goat Cheese & Pine Nut Phyllo Rolls are inspired by the Greek classic, spanakopita, a layered “pie” which is typically made with spinach and feta cheese wrapped or layered in thin, crisp phyllo pastry. It’s not uncommon for regional variations to contain other wild greens or herbs in addition to or in place of the usual spinach. It’s the sort of hearty, rustic dish that lends itself to experimentation with whatever fresh, local ingredients are readily at hand. Our version uses fresh goat cheese together with thick yogurt cheese or cream cheese and a sprinkling of parmesan to add fresh, tangy flavor that’s not overly strong or salty. 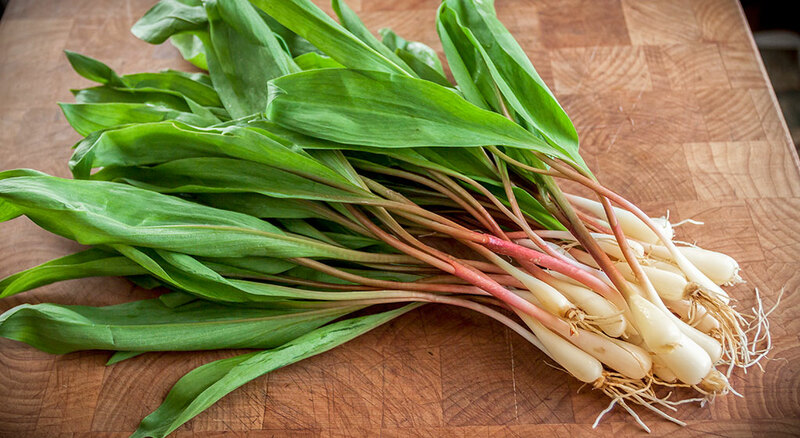 Of course, ramps (Allium tricoccum, also known as wild leeks) are a purely North American thing, but they are not dissimilar in flavor to wild onion relatives found in many parts of the world. The famously potent flavor of the ramps is somewhat tempered and mellowed by cooking, yet still gently, but persistently permeates the finished rolls with its wild presence. Delicious whether hot from the oven or at room temperature, these flaky rolls are sufficiently satisfying for a light lunch on their own, but are also perfect as picnic fare or appetizers. A very easy recipe that can be adapted to any ingredients that you already have on hand. Use any combination of spinach, arugula, sun-dried tomatoes, spices and other fresh, leafy greens and herbs from your garden. Chop the white to pink parts of the ramps into a small dice; slice the green parts of the ramps coarsely. Melt 3 Tbsp butter in a pan, add the white/pink parts and cook over medium-high heat, stirring, for 2 minutes. When the pan begins to get a little dry, splash in 1 Tbsp Marsala. Add the chopped green parts and cook, stirring, for another minute or until all the Marsala has evaporated and the greens are wilted. Set aside in a bowl. In a large bowl, mix the goat cheese, yogurt cheese, 3 tbsp Parmesan, smoky paprika, lemon zest, salt and pepper until blended. 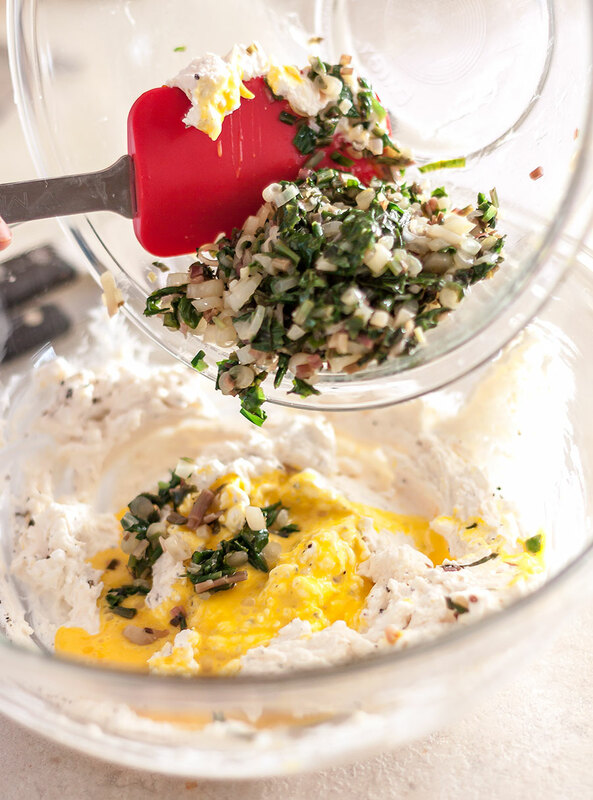 Beat the egg in a small bowl and add to the cheese mixture, along with the ramps, stirring gently until the ramps are evenly distributed. Add the remaining butter to a small bowl and microwave on low until melted. Brush 1 phyllo sheet lightly with butter, sprinkle 1 Tbsp Parmesan evenly over the top. Keep remaining phyllo sheets covered with a damp kitchen towel. Top with 2 more phyllo sheets, lightly brushing each layer with some of the remaining butter and topping with Parmesan cheese. 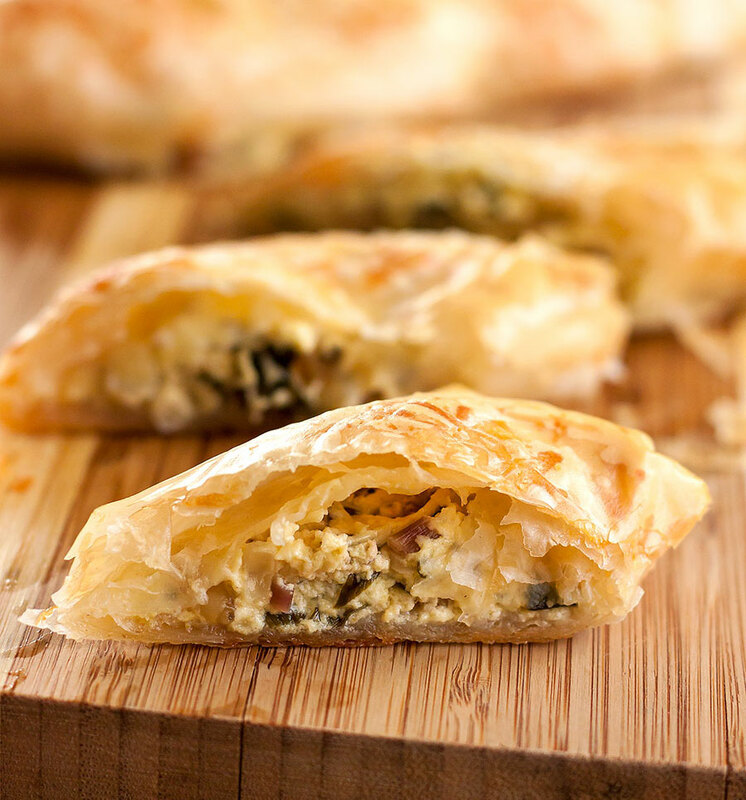 Spread 1/5 of the ramp-cheese filling along one short side of phyllo stack. 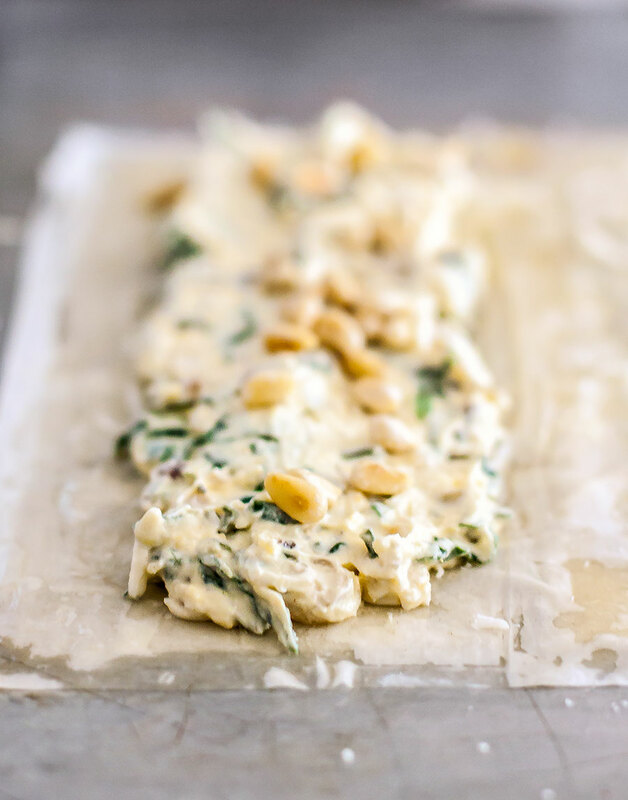 Sprinkle with toasted pine nuts. 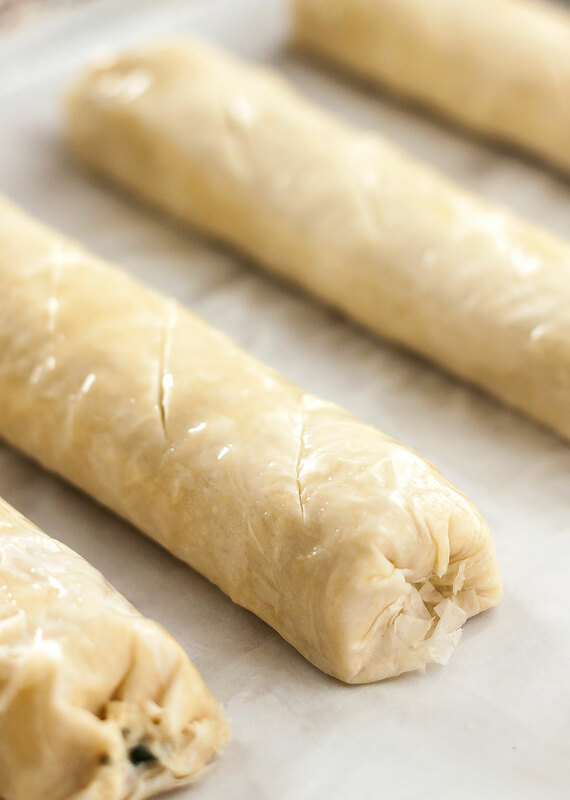 Fold in long sides of phyllo; roll up from one short side to make log. Repeat the process with the remaining phyllo sheets and filling to make 4 additional logs. Cover filled “logs” with a damp towel. Brush the tops of the rolls with the remaining butter. With a very sharp knife, make small (diagonal) cuts in the tops at 1-inch intervals. Place on parchment-covered baking sheet. Bake in 375°F oven for 27 minutes or until golden brown. Remove from the oven and cool for 5 minutes. Transfer to a cutting board. Use a serrated knife to cut each log into slices along the slits. Serve warm or at room temperature. Heat a small stainless steel pan large enough to fit the nuts in one layer, on high. Once it’s good and hot, take it off the heat, add the pine nuts and swirl and stir them around until golden brown. Empty into a glass dish and voila! No need to be afraid of burning them.